Auner Leather is a reliable wholesale and retail Online Shop with Diverse & High Quality Products & Best Price! 2. Color may be little different due to monitor . ✪ SAFETY & PRIVACY - The RFID Protection Design can perfectly block unwanted RFID scanners. 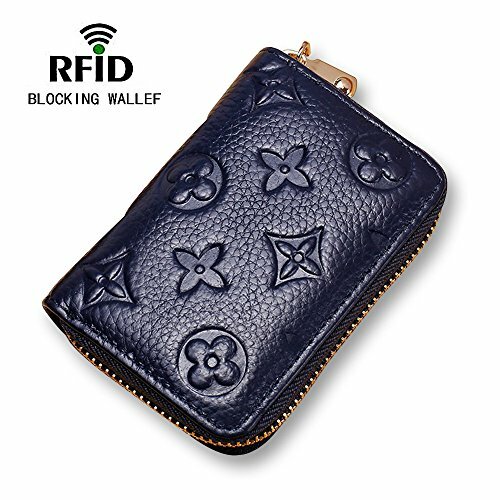 The included RFID blocking technology can prevent unauthorized access to personal information. ✪ COMPACT DESIGN&HIGH CAPACITY - The 10 secure card slots fold accordion style, 2 cash slot, keep cards well organized. ✪ SUPER STYLISH FOR TRAVEL - Its compact size of 10.5*8*2.5cm(4.14*3.15*0.99in)(L*W*H) 90g allows you to bring it along in your handbag, backpack, or pocket. Great and convenient for the everyday commuter or traveler. ✪ SATISFACTION GUARANTEED - We can provide the 100% money back guarantee for you in 365-day. If you have any questions about this product by Auner, contact us by completing and submitting the form below. If you are looking for a specif part number, please include it with your message.